Every year in September, Ottawa becomes the centre of the Animation industry universe. The Ottawa International Animation Festival, running from September 16-20 is one of the largest events of its kind, draws industry collegues from around the world and showcases the best in Animation film. The Animation shown at the OIAF is so great, some of the competition winners have gone on to win Academy Award nominations. OIAF will draw over 30,000 attendees during its 5 day run in September providing a big boost to the city’s Tourism sector. The competition will feature 79 entries from 23 countries. In addition to the film screenings, workshops and talks are held for industry collegues. 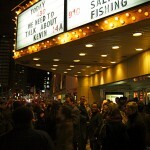 There will be 8 Canadian films screened in the festival and an additional 39 that are part of the event. The National Film Board has three short films in the best narrative short category, which are Focus by director Alex Boya, Autos Portraits by Claude Cloutier and Sweet Talk by Esteban Azuela. m Elliot, World of Tomorrow by Academy Award nominee Don Hertzfeldt and Wave ’98, the winner of the 2015 Cannes Palme D’or, which was directed by Ely Dagher. This entry was posted in Blog and tagged Animation, OIAF by David Dugas. Bookmark the permalink.